Sighing Like a Furnace | Separated by a common language. I seem to write a lot when I am eating, which makes me want to tell you all about the delicious food I am eating. Ready? Go! I am enjoying a nice, warm bowl of french onion soup. Is there much else that tastes better on a cold, wet day? I doubt it. Not to mention it makes my breath smell like an old farm. Love it. Isn’t it just the cheese though that really makes this soup? You can pretty much put cheese on anything and I will eat it with a vengance. Lasagna, pizza, nachos, a tire–you name it. I once did a cleanse when I was working at Starbucks a few years ago and I wasn’t allowed to have any dairy. I was NOT HAPPY. I know now that I can never be vegan…unless I develop a thirst for bludgeoning people out of rage. Wouldn’t that be kind of ironic? Now if I show you something THAT ugly, I have to show off something nice. Check out my entrelac scarf! Isn’t it bootiful? It took me a good 20 tries (I kid you not) to actually get the beginning of this damn scarf right, but now I am on my merry little way, and it’s looking like it’s going to be a favourite, you know, when I finally get done. I’m using this really nice Japanese yarn that I am BANANAS over, and it’s making the scarf look really interesting. I love how it looks woven, but it’s actually just one, continuous piece of yarn. I THINK I JUST BLEW YOUR MIND. Anyhow, all this typing is stopping me from eating my soup! I must finish the cheese! That yarn did blow my mind. It kinda looks beaded. Very nice. ahhh soup…nectar of the gods! I with you I’d prolly eat ANYTHING if it had cheese on it!!! That bikini mitten…absolutely the most ridiculous thing I’ve ever seen…reminds be of something worn on a bad star trek episode!!! I do love how your scarf is coming out…are you using koigu? 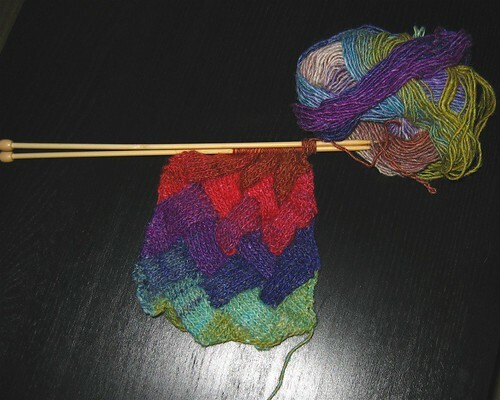 It’s just amazing how cool it is knitting up with the weave and the variegation of the yarn. Yay!!! It’s actually Noro Silk Garden Lite. It looks like it’s really rough, but it’s nice and soft, and I’ve heard if you put it in a soak with some conditioner it gets really nice and soft! Mitten bikinis are awful. That scarf is awesome. Where did you get the pattern? I must have one. I love cheese. And also? I can NOT stop thinking about the email you sent me yesterday, which is why I have not written you back, because? Oh. My. GOD. Bikini mitten rules. That is all. 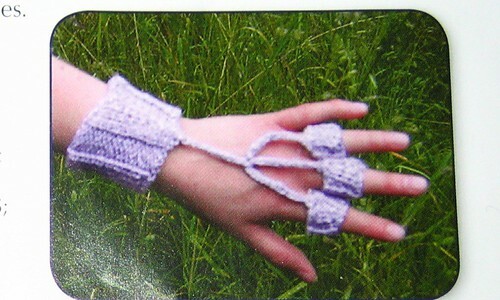 i may have nightmares of the bikini mitten. i’m….i’m so glad her wrist is staying warm. baha, those “mittens” look more ike the USB symbol. I loooveeee your scarf. I made scarf just life that out of Noro. The pattern is Dancia. Yours is gorgeous!